Heat the two cups of water until they boil. Add the rest of the ingredients, mix well and cover. Lower the heat and continue cooking until the grains of rice have opened and are tender. Add a bit of grated Parmesan cheese when you serve to give is a tasty touch. Pumpkin recipes are my favorite way to kick off autumn. 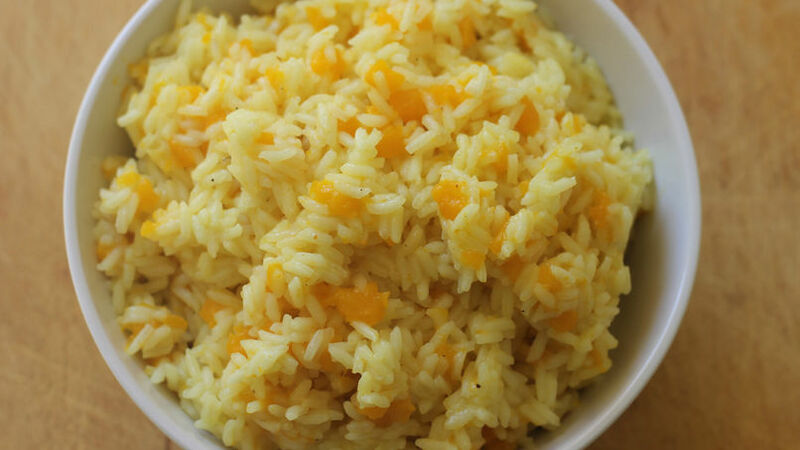 They’re usually very economical and pretty easy to prepare, like this rice. It's a dish that every one likes thanks to the taste of the butter and curry and fuse beautifully with the creamy pumpkin. Preparing rice with pumpkin in my house means fall has arrived. It's a dish that represents the season with its colors and also combines well with tender meat. What else would you serve it with?